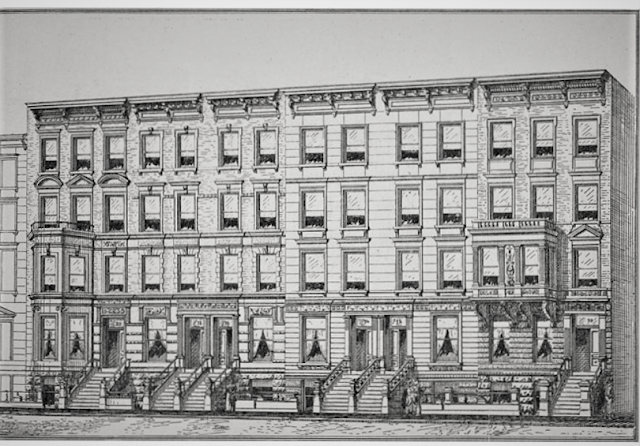 On Monday, January 25, 1886 Charles Graham & Sons broke ground for its latest project--six upscale homes on the south side of East 78th Street, between Fifth and Madison Avenues. Charles Graham doubled as both the developer and an architect. His design concept for the row was both interesting and unusual. According to the Real Estate Record & Builder's Guide, "Their dimensions will vary, one being 26x100.5, one 25x60, two 20x60, and two 17x90." The central four homes were designed as pairs of two mirror-image structures. The two end houses, Nos. 20 and 10, had little architecturally to do with either each other nor the rest, other than height. The $150,000 cost of the project would place the average cost of each at just under $600,000 today. Completed in 1887, their blend of red brick and white limestone created a striking contrast. Graham gave No. 20 a spattering of several architectural styles. The basement level was clad in rough cut limestone, its entrance below the high stoop with brass railings. The entrance was flanked by planar stone blocks alternating with undressed bands, looking like mortar oozing from between newly-laid bricks. Three-quarters of the way up the personality changed as prim fluted pilasters upheld an entablature of delicate carved swags of flowers. Another floral-carved panel sat directly over the doorway. A three-sided bay rose to the third floor where a brass railing protected its balcony. Here Renaissance Revival pediments graced the openings. The whole was crowned by an elegant bracketed cornice. In September 1887 Charles Graham & Sons sold No. 20 to Michael Bernard Fielding for "58,000 cash," according to the Record & Guide. That price would translate to about $1.37 million today. Born in Troy, New York, Fielding was a former president of the Cotton Exchange and a partner with Nicholas Gwynn in the firm Fielding, Gwynn & Co., cotton factors and commission merchants. He was also a director in the Corn Exchange Bank. Decades later Theodore H. Price fondly remembered him as "probably the best extemporaneous speaker that has ever been a member of the Cotton Exchange." Michael and his wife, the former Mary Ann Ridge, appear to have lived here alone with their servants, their six children now grown. While the wealthy couple did not own a summer estate, their names appeared at fashionable resorts like Saratoga Springs each year. On October 17, 1903 the New York Herald reported that Fielding "died from a complication of diseases yesterday," adding that he "had been ill for a long time." The Brooklyn newspaper The Standard Union noted the same day that "the death of M. B. Fielding was announced on the Cotton Exchange this morning. Mr. Fielding was vice-president of the exchange in 1872 to 1873 and president in 1882 to 1884." 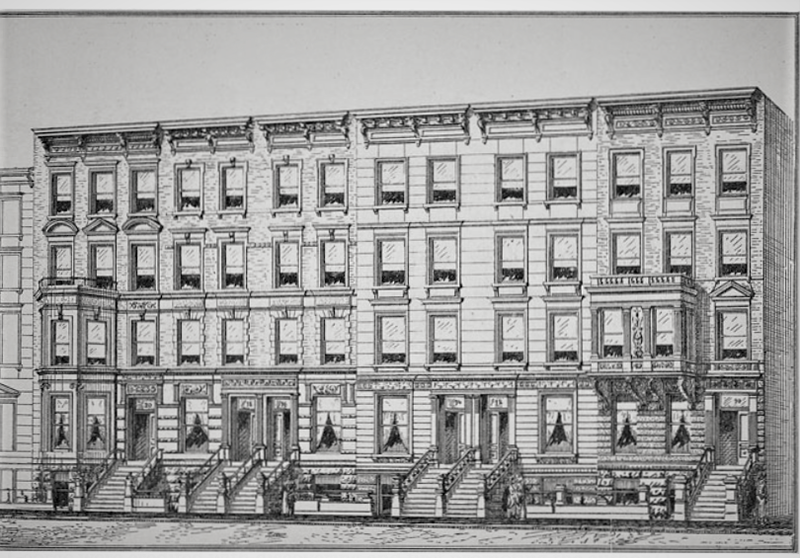 Fielding's funeral was held in the 78th Street house the following Monday at 2:00 p.m. Mary remained here for just over a year, selling the house on May 5, 1904 to Isaac David Einstein. The widower paid $82,500 for the property, or about $2.4 million today. Born in Laupheim, Germany in 1842, Einstein was president of the International Handkerchief Manufacturing Company. He came to the United States alone when merely a boy, first settling in Alabama. When he was 14 he moved to New York and in 1872 established his own business, importing fabrics from Europe. Isaac was described by one newspaper as "one of the most successful merchants in that line in the country." Despite its misleading name, the firm not only manufactured handkerchiefs, but other items like lace curtains. Einstein was involved in rug-making and dyeing firms as well. Einstein and his wife, the former Thekla Rieser, enlarged the house. In July they hired architects Chappell & Bosworth to design a one-story extension in the rear that cost them around $291,000 in today's dollars. Like the Fieldings before them, by the time Isaac and Thekla moved into No. 20 their children, Milton and Francis (known as Fannie), were grown. As was the case with all the families along the block, the Einsteins maintained a domestic staff. On October 1, 1916 Thekla placed an advertisement for a servant to do "General Housework, assist with laundry. Must have First Class personal reference." Isaac and Thekla would live in No. 20 for three decades. Despite his advancing age, he remained active and in control of his businesses. He was a trustee of the Metropolitan Museum of Art for years. On May 11, 1936 the Broadway Association honored Isaac with a luncheon at the Hotel Astor as "the oldest living pioneer merchant associated with 'The Great White Way.'" In reporting on the event The Niagara Falls Gazette noted that he "witnessed the opening of the Brooklyn bridge in 1883, is Broadway's oldest first nighter [a term applied to the fashionable set who made it a point to attend opening night of Broadway plays] and has seen 23 mayors come and go." Einstein told the assemblage, "There used to be farms all over that area next to Times Square, and the retail shopping district was below Canal Street. Then, too, when I got here there were no telephones or automobiles or skyscrapers. But outside of that, everything looks pretty much the same." It would be the last large event the 94-year-old would attend. Seven months later, on December 3, The New York Sun reported "A private funeral service will be held for Isaac David Einstein, president and a director of the International Handkerchief Manufacturing Company, who died yesterday at his home, 20 East Seventy-eighth street, following a short illness." Thekla Rieser Einstein remained at No. 20 until 1944 when she moved into a suite in the Hotel Plaza. She died there in October 1953 at the age of 87. In 1965 a renovation of the house resulted in a triplex apartment in the basement through second floors, and one apartment each on the third and fourth. At this time the stoop was removed and the entrance lowered to the basement, below sidewalk level. When the stoop was removed the cast iron newels were retained as gate posts. Then in 1997 plans were filed to return the house to a single-family residence. It was home to filmmaker Pia Christina Getty until 2003 when she sold it for $14 million to financier Michael Price and his wife, Jennifer. 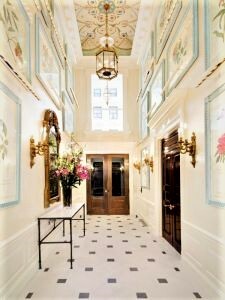 The couple hired David Easton to redesign the interiors. Michael and Mary Ann Fielding would have found the basement gym and wine cellar startling. 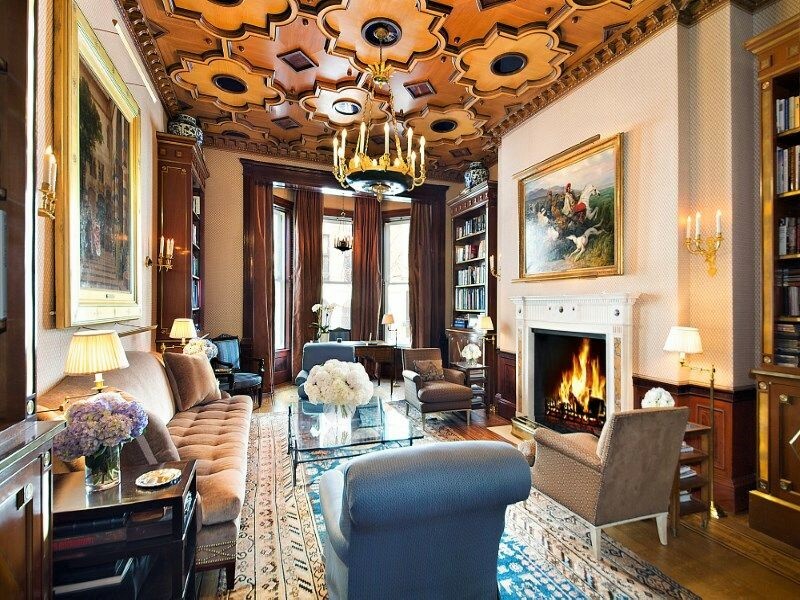 The Prices put the house on the market in the spring of 2016 for $38 million. The real estate broker described seven bedrooms, 8.5 baths and a double-height windowed gallery" with a distinctly European sensibility." Security was ensured by a bulletproof entrance door, infrared detectors and cameras inside, as well as a panic room with telephone, 12 television monitors, a refrigerator and stock of food supplies. The 1887 brass balcony railing has achieved a delicious green patina in its more than 130-year existence. While the interior of the Fielding house went through the elaborate changes, the outside has survived nearly intact, albeit without its 1887 stoop.